I come with good news!! Today I met with my oncologist and we just spoke about how I was feeling and then he said he'd looked at my last CT scan (which I think was the week before last) and he said the tumour has shrunk again. Wohoo!!!!! He said that the two lympth glands in my neck were coming along really well too, I say that because I can't actually remember what he said but I know it was good lol. He seemed impressed, so I am too. I don't get too excited though, one day at a time and all that. Radiotherapy is going well, I don't really want to go on about it too much because with my luck, I know I'll jinx myself. It's just the way things seem go in my life, when I first started chemotherapy the first few days I felt great (probably due to the steroids) and I was bragging like "Oh, I feel great. I'm not going to get side effects blah blah" and then BAM they hit me like a ton of bricks, haha. It's going okay though, the mask doesn't really bother me that much anymore. It goes SO fast - I think maybe I wear it 10 minutes each day but the actual treatment is about 20 seconds to the left side of my neck, 20 seconds to the middle of it and then 20 seconds to the right side. So it's not that bad. Only part I hate is the travelling and the waiting, but it's no one's fault. I just get bored. When I went in to the room today a radiographer introuduced herself and said "Hello, I'm (name), I feel like I know you already because I read your blog" Lol. It made me laugh. I don't think I realise how many people actually read it, but usually every day I get at least one person mention it. 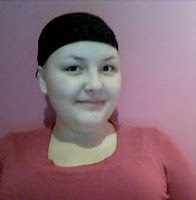 I also had chemotherapy today, it took about an hour. I feel alright, they said that I wont get that many side effects with this drug. It's called carboplatin - the three drugs I was having before were called taxotere, cisplatin and 5FU. This drug is like cisplatin but has less side effects, which is good because it means my hair is going to start coming back. It's already growing, still just stubbly stuff but at least I have some, haha. I do still get shocked at night when I take my bandana off and look in the mirror I'm like "Oh yeah, I'm bald!" I can't wait to have hair. My PEG is still really sore, much better than it was though. Last night when I tried to flush it I was really trying hard to push the water in but it just would not budge so the water ended up exploding all over the bathroom, it made me laugh. When I woke up this morning there was some yucky stuff around it so when I went for chemo today I told the nurses and they had a look. The head and neck specialist came down because she deals with PEGs and she loosened it for me...it feels so much better now. I feel like I can (nearly) stand up straight!! It's not infected or anything, it's apparently quite common to get stuff around it. It's just stuff from my stomach...gross or what lol. Oh, one of the nurses managed to flush it today too so it's all good. More radiotherapy tomorrow...and the day after, the day after that. etc etc etc Basically for the next 6 weeks and 2 days, haha. I can not wait for it to be over, but I have no problem with doing it or anything. As long as it helps I know it'll be worth it. Ooh, I saw the dietician today. She asked me how my swallowing is (it's fine) and said that just to carry on eating what I want (trust me I will lol) and then if I get any problems then to give her a ring and we'll arrange the food supplements or what ever. Hopefully it wont come to that though. Fingers crossed. I'll leave this here...thanks for all your lovely comments. Keep leaving them for me because I really do enjoy reading them. P.S This is for Val. You left me a comment on my PICC Line entry and I'd really like to stay in touch with you but don't have your email or anything so please could you leave your email address or email me at hayleydyer@gmail.com - thank you! I'm a middle aged woman and was diagnosed with ovarian cancer right before Christmas. Even though we are many years apart, I relate and empathise with your struggle for recovery. You are a brave young lady and must possess a very old,beautiful soul *S*. Keep up your positive, strong outlook. I know you are so going to kick your cancer to the curb!!! The news is getting better for you Hayley. Why not put a 'hit counter' on your blog. I use Technorati. It's free to sign up with and it tells you when people visit you blog and where they came from in the world. It can be interesting reading. Yay Hayley I am really excited by your news! :o) I am THRILLED too that your radiotherapy is going well, that you're managing it all just fine, and that the time spent in your mask isn't that long. That's fab! Fist an apology that i havent left you a message in a while! I do read your blog and comments every day and think its fab! Great news about the tumour and lymph nodes, i done a little gay dance around the kitchen after you told me! Ha ha. Anyway i best go its only 8 in the morning and i have got a busy day ahead of me! Love you lots and lots and lots and lots and lots and lots! Hi Hayley, I just read your last three posts, I didnt had access to net for past weeks, than my laptop broke down so I wasn't able to come on net, today I got the chance and I opened your blog first, I can't tell you how happy I am about your progress, you have come a long way, Its such a great news that the tumor is shrinking its not long before you will totally get rid of it. Please know that you are in Our prayers always. I found your blog because of your posts on the Oral Cancer Foundation website. I wish you the best of luck, you're a hero to me! at such a young age you seem to be handling all you're going through with considerable grace and spirit and I hope to follow your example. I too have oral cancer and am to begin radiation therapy soon. I thank you for sharing what the experience is like here, it helps to know what I can expect in the upcoming weeks. Congratulations, it is wonderful to hear that your tumor is shrinking, I'll continue to follow your posts and will be cheering you on from Virginia! Just found your blog and leaving a message as you requested in an earlier post.I am so glad the tumour is shrinking, will be thinking of you and sending good vibes. I'm still reading your blog and I am still the old mom with the kid who had cancer last summer. Per your earlier request, I thought I'd tell you where I live. It's a tiny town called Kendallville, Indiana in the US. You'd have to have a pretty big map to find it because it is so small. It's a lot easier to just look about halfway between Detroit and Chicago and imagine that's where I am. My son lives in Fort Wayne, Indiana, which is a lot bigger city about 20 miles south of here. He's still feeling really good. Yesterday he skipped his appointment with his doctor. We had a lot of snow and he was tired from working on a big project all week. Plus, he says he feels too healthy to be sick ... so he rescheduled and won't go back to see the surgeon for another 6 weeks. Can you imagine that? Six weeks between doctor appointments? I hope it happens like that for you soon too. Well, except I'm not advocating for skipping appointments and I hope you don't have tons of crappy snow. I'm so glad to hear the tumour is shrinking! This is Jason Leach, Jody's brother. I came to your 18th and we bought you somewine (sorry it wasn't much) and you sent a lovely thank you card with the word 'yummy' in it. I was shocked to hear your news, your mum was a good friend to me when I lost my partner in 2003. Anyway, I never really realised how brave you were until 2 days ago when I was diagnosed with cancer of the Oeusophegus (I think that's how you spell it). I am waiting for more detail on Wednesday. I have to say that I am terrified. But reading your blog has made me feel inspired and less terrified. I fully appreciate how brave you are now and have only admiration for you. I am sending positive vibes with special shrinking powers your way. I will see you at the charity auction. Say hi to your mum and Pete. It's Jay again. You have inspired me to do my own blog called 'Kicking The F**k Out of Cancer'. How do I put a link to yours on mine? Correction 'Beating the F**k Out of Cancer'. Hope you are feeling good today. I am off in for more news and a camera test at 1 today. Same blog just more relevant address. Hope you are feeling alright after your treatment. Just want to ask you and all the guys involved in this blog a favour. A friend of mine dave, his dad has small cell lung cancer. Can we all just send positive vibes out for him. His name is Bill Dennis. He is having chemo and radio and his tumour is shrinking. Let's make it shrink some more guys.